Skydive York is hosting canopy coaching until Sunday with Cornelia Mihai, who placed first in canopy piloting at the French, Italian and US nationals last year. |Picture: Patrik Minar, Skydive York Facebook. SPECTATORS will see extreme freefalling when York hosts the national skydiving championships for a fifth time. The disciplines on show at the March 21 to 26 events will feature skydiving in various formations, from vertical to canopy freefalling and artistic accuracy events. Event organiser Tom Gilmartin from SkydiveYork said the best athletes and teams from around the country would provide spectacular action as they fell from the sky. “The five-day event will feature all the various forms of competition skydiving, including all the freefall disciplines, canopy relative work and the visually spectacular canopy piloting,” he said. He said the championships provided a great family day out and urged anyone with an interest in skydiving or aviation to visit the drop zone. “The skies will be full of falling humans and as the competition progresses there will be an increased atmosphere,” he said. 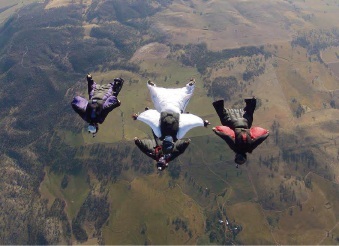 About 140 skydivers will begin arriving in York from today and will take to the sky for practice drops from Sunday. The adrenalin-pumping action will run from 8am each day of the competition at Skydive York, Australia’s first purpose-built skydiving facility. Opportunities to freefall over country and coastline are available from the York base during the year. For event details, visit the Australian National Skydiving Championships Facebook page.